— Astronauts flying on board space shuttle Endeavour's final flight declared assembly complete of the International Space Station this past week, but thanks to a special delivery being left at the orbiting laboratory, the station crew's assembly work has just begun. 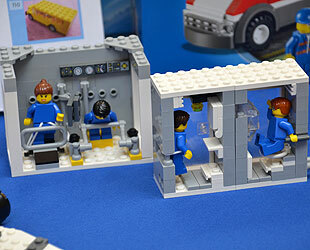 Crew members will build the not-so-miniature LEGO ISS aboard the full-scale — and now fully-complete — station. With their station assembly work completed, Endeavour's six astronauts departed the ISS late on Sunday evening, leaving behind the LEGO-version of the orbiting outpost for the station's crew to build. "I think my LEGO skills are pretty good," Garan said from aboard the International Space Station. "I'll have to see." 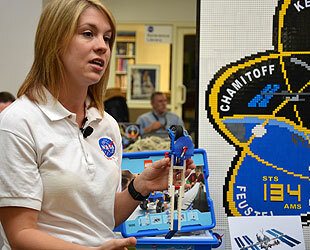 Originally, another astronaut, Cady Coleman, was slated to be the first to build the LEGO models and "trained" with her 10-year-old son, a self-professed LEGO-enthusiast. A delay to Endeavour's launch however, led to Coleman leaving the station mid-way through the STS-134 mission, before she could demonstrate her brick building skills. NASA has made sure that any of its astronaut can build the sets, in ways similar to how kids learn to build LEGOs on Earth. "We do what is called on-orbit training for them," said Teresa Sindelar from NASA's Teaching From Space office at the Johnson Space Center in Houston, Texas. "What we have done is created a Powerpoint [presentation] that basically has a before and after and then on board in the crew library there is also what we call the building guides and there is also a building guide book." 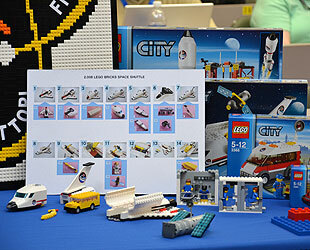 "It's pretty much a step-by-step [guide] and the idea here is that we want to keep it as close as what LEGO does on the ground as we do up in orbit," said Sindelar. The crewmembers have been provided a slight advantage though, given the very small size of the individual LEGO bricks and the weightless environment they are in. "We are sending these models up in chunks," said LEGO Designer Daire McCabe, adding that the individual chunk's bricks will be glued together. "It won't be assembled brick by brick, it will be in chunks." "So it [will be] very easy for astronauts to assemble in a very difficult environment," said McCabe. One of the first models the crew will build, a "very small" satellite, will be put together just as it is on the ground. "The astronauts will build one in space, and kids will build the same model on Earth, to see how long it will take in space and how long it will on Earth," said McCabe. "From then on, we want to focus on a little of the building and then focus on the icons [the models build], teaching and talking about the models." 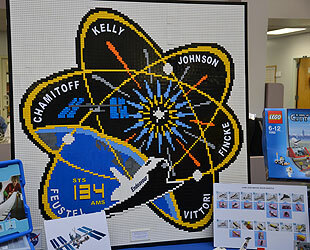 "We did preassemble some of the pieces of the LEGOs," said Sindelar, "but we want to make sure we keep it as consistent as possible so when you are comparing life on station with life in a classroom that you have good data." "Thirty models are going up on this flight," said Sindelar. "We're calling that 'phase one' of this on-orbit part of the partnership. There's also a 'phase two' portion that'll send up three additional models and those will be models that will [include] robotic programming." Most of the time, the crew members will be asked to follow the directions and build the models as planned, but some of the astronauts have had their own ideas, too. "Some crew members have decided that they are going to make a whole new model out of [the sets], and see what they can come up with," said Sindelar. Before they get too creative however, the crew members will focus on assembling their home in space. "One of the first models they will build is the International Space Station, which is a huge replica we have of the space station. They will build that in sections. It is quite complex, so it will be in small sections," said McCabe. 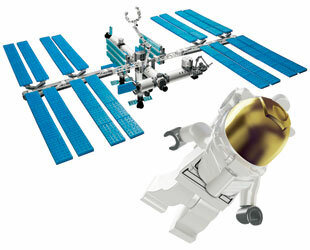 Since the NASA-LEGO partnership was first announced in November, which included revealing an image of the ISS model, fans have been asking how they can build one just like the astronauts. "We've had a lot of people asking about the space station — from every direction people are asking about it," said McCabe. "Personally I would love to see us do it so never say never, but there are no plans right now." "One of things about the [space station] model is as it is on Earth, it can't stand because it is too heavy. The solar panels fall off. It will only work in microgravity," he said.